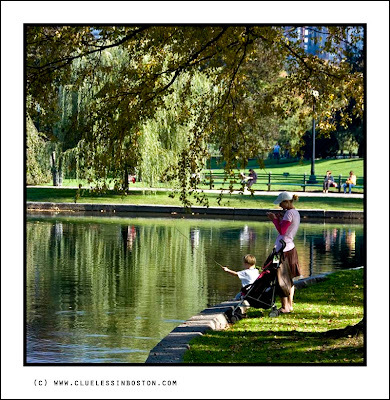 Imaginary fishing in the Public Garden Pond while mom uses her mobile device to text someone. Mobiles; the damned things have taken over the world. Guess they are just not me. this photo does make one wonder what that little boy will be doing while his children are fishing? Difficult to imagine the picture is taken at the end of october.. It looks like a summer picture! I like the reflection on the pond, and the tall buildings that can be guessed behind. Even in a quiet place like that, modernity is never faraway.But even there, a little boy is happy to play fishing..
Good thing it's not the other way around. What an idyllic scene. A classic of for our time. Love this shot. There is even a circular ripple effect on the lake that helps complete the illusion of the little fisherman.